Not the kind of shell you find in the ocean. When a computer geek talks about getting a shell, he or she generally means a command line interpreter shell. This is where you type in a command and the computer figures out a response to type back at you. Ah, but what good is a shell? Anyway, when you really want to have fun with programming, you use a shell. It's part of the fun. There are essential conversations you can have with a computer in command-line shell that you just can't have in a graphical user interface. So, how do you get a shell? That depends on your operating system. Some OSses, like Android and iOS make it kind of hard to get a shell. Others, like pretty much any Linux OS or BSD OS, pretty much give you the shell without you even asking. Unless you have X11 (so-called XWindows) running, with a desktop manager and a window manager set up, the first thing you see after login is most likely a shell prompt. There you are in the shell. Shells have been around a long time, but they are still quite useful. If you have a desktop manager and window manager installed and running, look in your "Applications" menu for something like "Terminal" or "Xterm". If not there, look in the "System" or "Accessories" sub-menus. Common desktop/window managers include KDE, Gnome, and XFCE. I personally prefer XFCE. It's clean and simple. KDE is quite usable, but has a lot of advanced gadgetry that might suprise you. Gnome is currently an attempt to look like the Microsoft Metro interface ought to. I do not care for it. But you might like it. It does take a lot of processor power and memory. I'll have to put up a post on installing Linux, and choosing and setting up a desktop/window manager combination sometime, I suppose. On Mac OS X 10.4 and earlier, look in the Apple "Application" folder, and look in there for the "Utilities" folder. 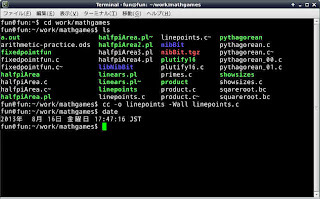 Then look for an icon that looks sort of like a small computer screen, called "Terminal.app". 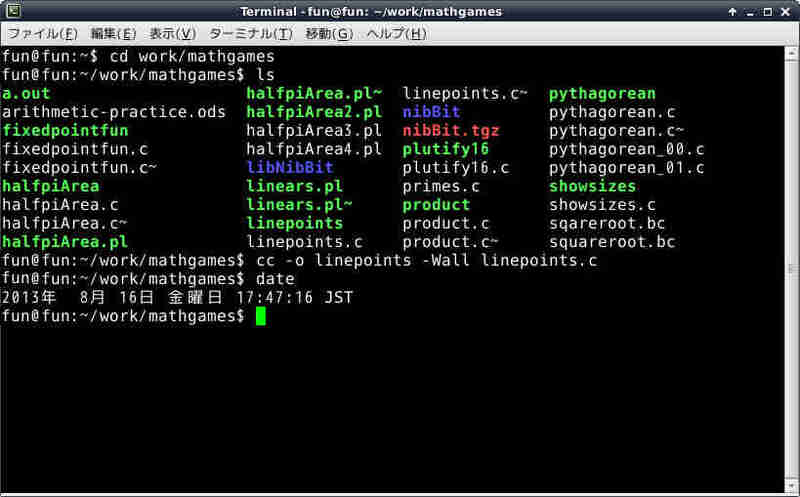 There may also be another shell application, called "XTerminal.app", if I remember right, which would also be okay. Double-click should launch them. I haven't really used Mac OS X since 10.4, but I think the shell is still in the same place. Classic Macintosh did not have a full shell. You could download a perverse super-shell called Macintosh Programmers Workbench, instead. Also, you could use an all-in-one IDE like Metrowerks Codewarrior. If someone asks me to, I might put up some posts on the subject. Microsoft also provided a perverse limited shell, up to around MSWindows 2000 and XP or so. Somewhere before MSWindows 7, they released their own perverse super shell. You can find them somewhere in the start menu, maybe under Accessories? I avoid using them because, well, as I said, they are both perverse. That is, they are different from the Unix/Linux/BSD shells in perverse and confusing ways. Official command-line shells tend to reflect the underlying operating systems. But we have other shells for MSWindows. The MingW and Cygwin projects provide shells ported from the Linux tool set. Mingw is smaller, but more oriented towards people skilled in computers. You can find the project here, with installation instructions here. Cygwin contains significantly more useful stuff than MingW. So it takes longer to download and takes more space on your hard disk. The project is here, and the installation instructions are here. Basically, you download the installer .exe, check the checksum (more things to explain) and run it. If you don't have much hard disk space, MingW can be useful, as I explained once here. If you have more space, Cygwin is probably easier for beginners to work with. You can even load both if you want. One example of the difference, if you want the arbitrary precision calculator BC, with MingW you have to download it from a different site, fix a bug or two, and compile and install it yourself, as I once explained here. (Good practice if you are ready for it, maybe a little scary if you are not.) With Cygwin, you can just download it and go.